Most cooks have a handful of go-to recipes — the ones that you know will be a hit with whomever you are serving. I don’t have to think too hard to come up with mine, which include a couple of main courses, a sandwich, an appetizer and a dessert. My baked pheasant with wild rice dressing probably tops the list, followed closely by my spaghetti sauce — with ground bison and Italian sausage. Fresh tomato salsa, apple crisp and Auntie Helen’s barbecues round out my top five. 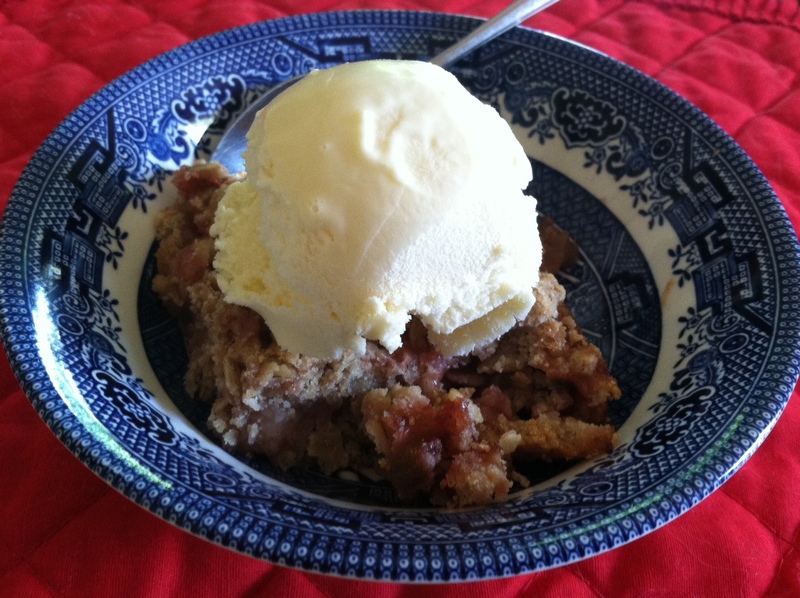 Now I have another to add to the list — strawberry rhubarb crisp. An abundance of home-grown strawberries and rhubarb this year had me searching for a recipes that contained both, and after looking at several pie recipes, I came across the following. The recipe fulfills three requirements that make it most appealing: It is quick, easy and tastes great. And one knows you can never have too many go-to dessert recipes! Preheat oven to 400 degrees. Place the fruit in a mixing bowl. Add the white sugar, cinnamon, salt and cornstarch. Stir to coat and add the orange juice. Stir again and set aside. In a separate mixing bowl, combine the remaining dry ingredients and then add the melted butter. Stir to combine. Press half of this mixture into a buttered 9-by-13-inch pan. Pour the fruit over the bottom crust and then sprinkle the rest of the dry mixture on top. Bake for 30 to 35 minutes, until the crust turns golden brown. Serve warm from the oven or let cool completely and slice into servings. Note: To make this recipe gluten-free: Substitute 1 1/3 cups brown rice flour and 2/3 cup tapioca starch for the all-purpose flour in this recipe.